The Foothills Parkway is a special roadway that was planned to provide panoramic views of the Great Smoky Mountains and to blend seamlessly with the surrounding natural environment. Foothills Parkway Bridge 2 is located in Blount County, Tennessee, northeast of the city of Townsend. 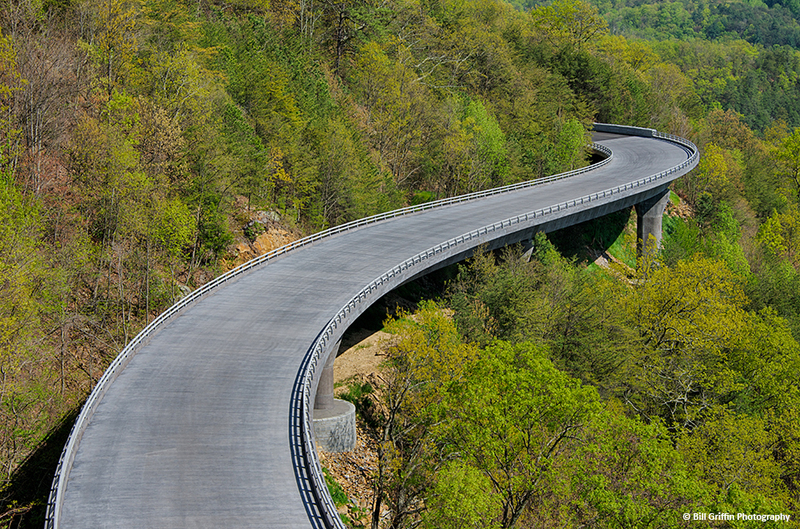 This design-build project consists of a two-lane bridge plus approaches along the “missing link” of the Foothills Parkway in the Great Smoky Mountains National Park. The project is being undertaken with the direction and coordination of the Eastern Federal Lands Highway Division (EFLHD) and the National Park Service (NPS). The 790-foot structure consists of five spans and snakes along the mountainous terrain. The bridge has a precast concrete segmental box girder superstructure and precast concrete segmental piers. The abutments utilize cast-in-place concrete with stepped footings on excavated benches to fit the steep topography of the site. The rugged terrain requires the use of long retaining walls, some in excess of 40 feet tall, along the approaches to the bridge. The design team developed innovative procedures to address the sliding and overturning design concerns for the CIP walls that include utilizing rock anchors through the footings to assist with the lateral stability. The general approach to the foundations for the project was to provide a foundation scheme that minimizes the footprint and disturbance to the site while being robust and reliable. The Foothills Parkway incorporates specific aesthetic requirements that facilitate continuity along the length of the roadway. The roadway approaches and the bridge continue the same aesthetic stone masonry look and characteristics of other Foothills Parkway bridge structures located near the proposed project site. Permanent and temporary erosion prevention and sediment control (EPSC) is vital to the protection of the sensitive environment in which this project is located. Palmer provided plans for EPSC measures to provide necessary erosion prevention and sediment control with minimal ground disturbance. On this project, EPSC measures were designed to support a 5-yr 24-hour storm event, rather than the typical 2-yr 24-hour storm event. Primary and secondary measures, consistent with current best management practices, were strategically placed at the limits of construction activity and coordinated for each work zone area.